This cardboard postal mailer is specially designed to fit within the Royal Mail PiP large letter sizing in both A5 and A4 sizes. Made from lightweight, durable, single wall cardboard, the cardboard mailer includes a strong peel and seal closure and zip tear strip for ease of opening. Perfect for posting a wide variety of products from A4 and A5 printed materials to t-shirts and clothing. Ideal for retailers and ecommerce business looking to dispatch volume orders while minimsing packing and postage costs. 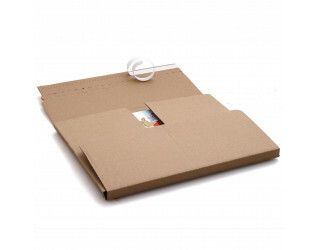 This cardboard postal mailer will fit through a standard UK letter box ensuring orders are delivered first time. Postal wraps suitable for Royal Mail Small Parcel and Medium Parcel sizes are also available. Large discounts are available for a pallet quantity orders.